This is the 8th album of the Danish rockers who always surprised their fans. Almost each album had a different touch - some more rock, another with a touch of punk rock or a bit gungy. Their latest album Soft Dogs is more a hard rock album. I have to confess that I never been a big fan of the band of singer Jesper Binzer, but they have their fans and are now around for about 15 years. And they are still signed by the Danish EMI, a major label. The band kicks off the album with the title track - a balladesque rocker. The production is excellent - done by Lars Overgaard. With the 2nd track - called What's The Matter? - they got heavier. More metal. A groovy track with a bit sleaze... But reminds me of something... Anyway, not a bad track. 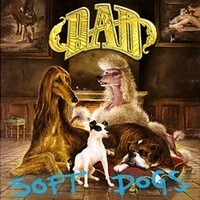 Perhaps a bit Quireboy-ish... With Golden Way they present the first ballad off Soft Dogs. Lyrically they deal with love and sorrow, but they don't get cheesy. A nice piece of music, but not enthralling like some other ballads. It Changes Everything is better, but I can imagine that if it would be an acoustic one, it would be more intense... The following track Un Frappe Sur La Tete is a heavy rocker. This one has power. The heavier side of Soft Dogs. My problem is that with every track some band names pop up in my mind. More uniqueness would be good... It lacks originality in my opinion, but I know that fans of the four-some would object. Well, that's my opinion. Fans of hard rock should check them out and find out for themselves, if they like or dislike it. It's not really a love-it-or-hate-it band, so give them a chance. Listen to What's The Matter, Between You & Me, Golden Way and Un Frappe Sur La Tete.